Description: What Christian would not want to hear Mark�s gospel as the first believers heard it? Using the tools of modern scholarship, Peter�s Last Sermon takes seriously Mark�s audience. The community would have heard rather than read the gospel. It would have encountered the story as a whole instead of piecemeal in short texts for sermons. Missing would have been the static of Matthew, Luke, and John. As for the speaker? While most modern scholars table the question of authorship, the postapostolic writers of the second and third centuries claim with one voice that (though penned by Mark) the gospel actually went back to Peter. So to hear the gospel as did those early Christians was to hear it as if coming from him. Does it make a difference to our understanding of Mark�s message if from Peter? Yes. And the result is surprising. Peter�s Last Sermon takes us on a journey through Roman and Jewish texts to meet the Jesus not of the modern Church but of Peter�s proclamation in Rome. Nero�s persecution had left the community in crisis. What was Peter�s message for his time? Christ was different from expected, he said, but how? James Dawsey shows that Christ broke the messianic expectations of his Galilean followers and the Jerusalem religious elite of his day. And as the reader of Peter�s Last Sermon will see, he surprised Mark�s hearers a generation later. The Gospel of Mark still confronts us in new ways. 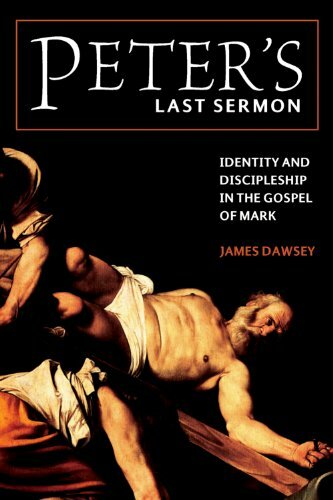 Citation: Adam Winn, review of James Dawsey, Peter�s Last Sermon: Identity and Discipleship in the Gospel of Mark, Review of Biblical Literature [http://www.bookreviews.org] (2012).